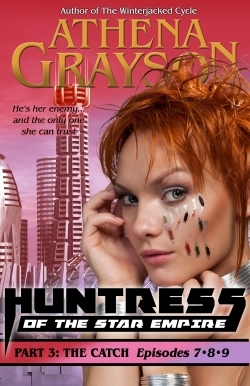 Ever since she was found in the aftermath of alien attacks, Treska Sivekka has been trained to one purpose–to hunt down threats to the security of the Union that gave her an identity. But when the Union’s biggest threat inspires desire, and not fear, it’s going to take all her training to protect her principles against his persuasive onslaught. 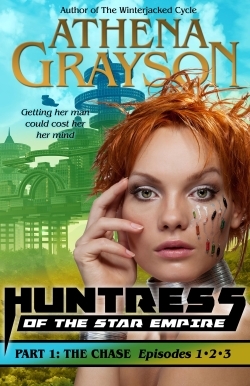 The Huntress’s neuro-collar and repulsor cuffs may keep Micah bound to her mercy, but they can’t stop him from challenging her convictions, and the lies she’s been told about his people. But when the secrets surrounding her own missing memories begin to reveal themselves, he may be the only one she can trust. 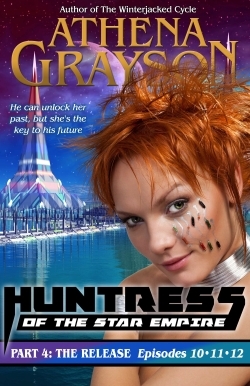 Pursued across the star system by the Huntress, helpless as his psionically-talented brethren were brought down one by one, Micah Ariesis must sacrifice himself in a sketchy revolutionary plot aimed at the Union’s heart, but the mystery surrounding his pursuer’s mysterious origins puts danger to a much closer heart—his own. 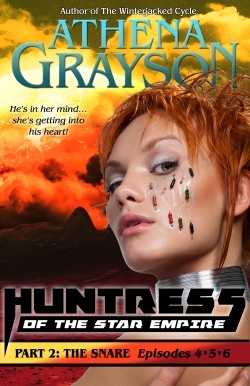 Huntress of the Star Empire is a sci-fi romance series adventure, told in weekly episodes released each Thursday until the season finale. The first season is currently available as individual episodes from Amazon, and in boxed sets at all other major retailers.